2008: Woolworths shop staff at Riverside in Norwich, who were made redundant after the chain went into administration, were offered some Christmas cheer by the Norwich branch of the FGBMFI. Retail staff were invited to join the Full Gospel Business Men's Fellowship International members at their special 30th anniversary dinner on Wednesday, December 17. The dinner at the Oaklands Hotel, Thorpe St Andrew promised to be a great evening with music and speakers, in the presence of the Lord Mayor of Norwich, Councillor Jeremy Hooke, and other guests. John Wright, an International Director of the Fellowship, said: 'We are delighted to have this opportunity to spring a pleasant surprise on Woolworths staff just as God sprung a wonderful surprise in the gift of the Baby at Bethlehem." Sue Circus, Duty Manager at Riverside Woolworths, said: 'We are all a bit overwhelmed. It is such a nice thing to do - full of the Christmas spirit." The speakers were singer-songwriter John Gaughan and entrepreneur Nick Szkiler, pictured above. After finding national fame with the pop group, Herman’s Hermits, John Gaughan became disillusioned to the point of suicide until his life was transformed by a new-found faith in Christ. John was restored and his inspirational music today touches other people's lives. Nick Szkiler, son of a Polish war veteran, started life as a disc jockey went on to be a director of a Jaguar car dealership. He also had a passion for vintage cars. But overwork and the tragic loss of twin babies brought him close to divorce, until he found faith in Christ - and his marriage was restored. 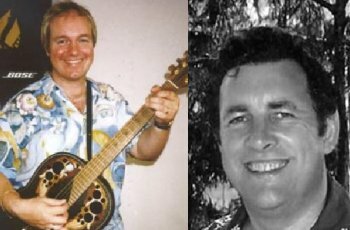 Now he promotes the Gospel through music, along with his friend John Gaughan. Very good to meet Nick and John again at the dinner. They each have a wonderful story to tell, which they did with humour and clarity. You are doing a fine work for the Lord. Praise God.